Standards are not about vendor lock in (or in the case of Apple, vendor lock out), they are about interoperability. 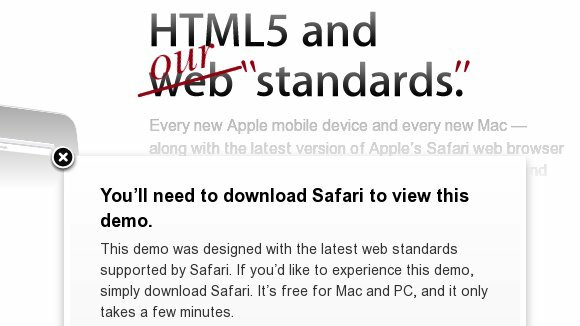 Apple’s recent HTML5 showcase, more appropriately named Safari Showcase, reveals Apple does not understand standards. Locking out browsers, as Apple does in their showcase, is not a best practice or in any W3C specification. Apple’s quest against Adobe and flash is not noble—don’t get me wrong, I hate flash. They are not embracing standards, they are embracing something they can control. Everything else is CSS3—well not actually CSS3 as -webkit-gradient, -webkit-transform-origin and -webkit-animation-duration technically are not CSS3 properties. They are all proprietary, vendor specific stand ins that follow the W3C standard for naming proprietary properties. Regardless, it is CSS3 that is doing much of the heavy lifting in the demos, not HTML5. This demo contains H.264 video. Windows users can download QuickTime to enable support for this industry-standard format. So an external codec is required, the point of the video tag in HTML5 was to remove the dependency on external applications/plugins. Apple must have been sleeping when this was discussed—oh wait, no they’re the ones actively pushing H.264 to be the standard HTML5 video tag codec. Looking at the container file for the H.264 video, there is no doubt Apple made these demos only for Safari–they used the .MOV container, only supported by Safari which does all of its audio/video support through Quicktime. If you want to read more about HTML5 and see some demos that will work on your browser (assuming you are not using Internet Explorer), check out fellow Weblogs.us user StrChr’s HTML5 page. Nice post. It will be interesting to see how “HTML 5” plays out. PS it is really nice that we have such a truly open (and popular) web browser in FireFox :-). Yeah it is nice that Firefox is open. Chrome is as well (technically webkit is too), but I don’t like the feel of Chrome (I have it installed on my desktop to test Webkit support of sites). I know why people say it feels “snappy” and it is not due to it’s speed (it is fast, don’t get me wrong), but the “snappy” effect due to it not doing progressive rendering of the page (waits until everything loads then displays it).